…I found a land of incurably hospitable and kind people, proud of their country and culture; infectiously good music, incredibly strong coffee, where they love both bloody raw meat and protein-rich red beans, dubbed ‘bloodless meat’ in this part of the world. My first real taste of Ethiopia was out in the countryside where I visited the work of GCP’s Tropical Legumes I (TLI) project in the field, on a trip to the bean fields at the Southern Agricultural Research Institute’s (SARI) research stations at Areka and Hawassa, which took us on a 600-km round tour, out of the capital Addis Ababa and into the Great Rift Valley beyond. 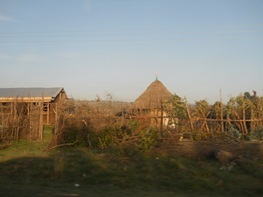 We set off early that cool morning, and as we headed into the countryside, I glimpsed many a local taking their first breath of morning air as they stepped outside from their decoratively-painted, round, thatched-roof homes, and shook the night’s sleep from their shoulders. So their day began – already there was smoke coming from the chimneys, and I imagined the lady of the house beginning to prepare for the first coffee ceremony of the day. Coffee is often accompanied by a dish of boiled red beans. Or maybe she was warming the pan for the morning injera – a kind of ‘teff tortilla’: a sour-dough thin pancake made of the local cereal, teff. Injera is an iconic ubiquitous component of Ethiopian cuisine, with which diners take all manner of wat, or stew made from a rich variety of ingredients – from legumes to raw meat, carefully rolling the spongy crepe around the filling twice, making sure no food falls onto the fingers, for dining etiquette strictly dictates against the licking of fingers. 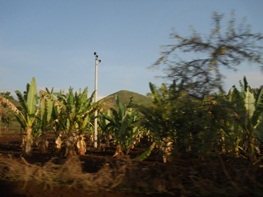 We pass score upon score of the gently-smoking thatched round huts – the traditional ‘living rooms’ in these parts; most dwellings are accompanied by modest smallholdings, with maybe a grazing goat or two, and many more with plantations of ensete – a banana-like plant, which, in spite of its inedible fruit, has long been a staple in Ethiopia. It is used for its root, which is mashed to make a tasty, stodgy, bread-like food called kocho, used to accompany meals, a denser cousin of the favourite injera. 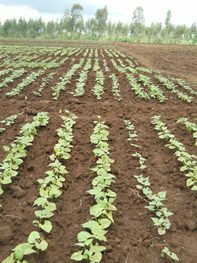 These smallholdings would also be the perfect size for cultivating beans, as they are not an acre-hungry crop, but grow happily on small plots of land, and in some areas are intercropped with ensete to maximise the space. Into this landscape we pass the incongruous addition of a herd or two of camels with their owners…significantly peculiar as these aren’t desert lands, but the edge of the Ethiopian highlands, gradually and graciously giving way to the majestic Great Rift Valley below. I ask my guide about the addition of camel hands to this highland scenery: he explains their strange presence is due to a growing food shortage which has forced these nomadic peoples further afield to find their fare. The appearance of these dromedaries and their human partners brings harshly to mind Ethiopia’s most notorious claim to fame – especially for anyone who recalls the mid-1980s – for whom Ethiopia will always be indelibly synonymous with famine. It also throws the work of GCP, and specifically TLI, sharply into the spotlight, for the over-arching objective of this project is to improve legume productivity in environments considered marginal for agriculture, due to heat and other stresses. Somehow, it seems that more of the world’s environment is becoming ‘stressed’ by the day, though luckily the giant beanstalk of our story is a hardy crop which can be grown on the poor soils and fragmented plots of these challenged lands. 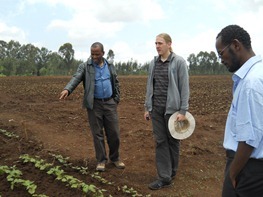 L–R: Asrat Asfaw Amele (SARI), Bodo Raatz (CIAT) and Daniel A Demissie (Areka Research Station) discuss the A–Z of beans at Areka Research Station. 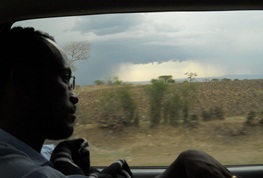 So the legume of choice for this most uncommon road trip is the common bean, Phaseolus vulgaris L, and our Ethiopian bean breeding expert is Asrat Asfaw Amele of the Southern Agricultural Research Institute (SARI), who is the Lead Scientist of the TLI beans component in Ethiopia. Asrat is our friendly guide and fount of knowledge of all things Ethiopian throughout this impassioned passage into the ‘bean valley’, and we are accompanied by Bodo Raatz of the Centro Internacional de Agricultura Tropical (CIAT), recently appointed Principal Investigator of TLI’s bean research. 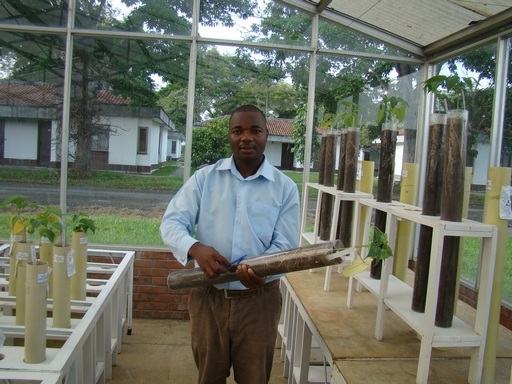 At Areka research station we are joined on our journey by Daniel A Demissie, who, along the way, shares his many insights on beans, diseases such as bean stem maggot (BSM), and on drought . We are chaperoned throughout by our courageous driver, Mr Abebe, who at times resembles a pilot as we seem to fly over the bumpy terrain in the plucky pick-up that is our steed for the day. 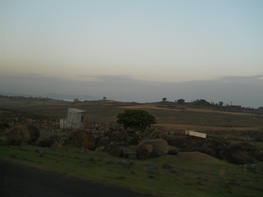 Against the scenic backdrop of the Ethiopian landscape racing by, with background music courtesy of Teddy Afro (whose politically charged songs, sweet voice and infectious rhythm have made him nothing short of a legend in his homeland), I take advantage of this long and winding road trip to interview Asrat, where his answers echo the whirlwind tour rushing by outside – from a description of the landscape he knows so well, and toils in every day – to the impact that this project has had on national scientists, the impacts on farmers’ lives, as well as impacts that are likely to come in the not-too-distant future. We consider farmers our partners. 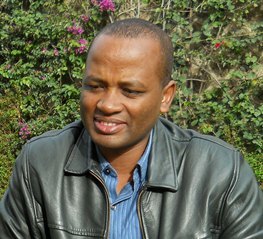 We try to understand what farmers are looking for, what they like, and we try to include their interests in our breeding materials so that the breeding materials released by our institution start to get wider adoption.” – Asrat Asfaw Amele (pictured). 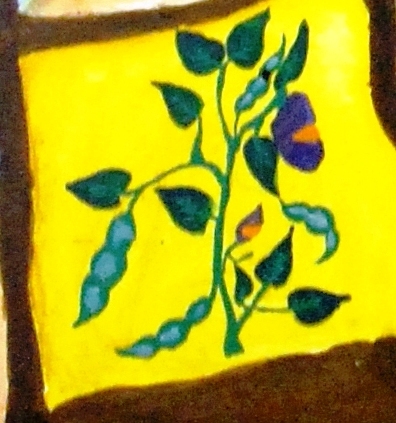 So the ‘magic beans’ of our story tell of a rich brew brimming with such potent ingredients as molecular breeding, capacity building, partnerships spanning continents and research systems, true teamwork with the farmers in the fields, and the drive to conquer the new challenge of a changing climate. The impacts from the TLI project are the pot of gold at this rainbow’s end, showing that fairy tales do come true, where ‘magic beans’ put down roots and grow real shoots, and are not just ‘castles in the air’. 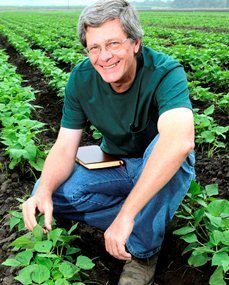 BREAK-TIME AND BRAKE-TIME from beans for a bit: Steve Beebe takes a pause to strike a pose in a bean field. 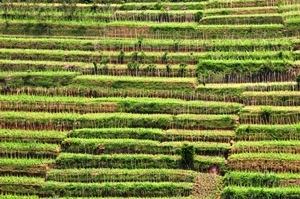 “These [molecular breeding] techniques, combined with conventional methods, shorten the time it takes to breed improved varieties that simultaneoulsy combine several traits. 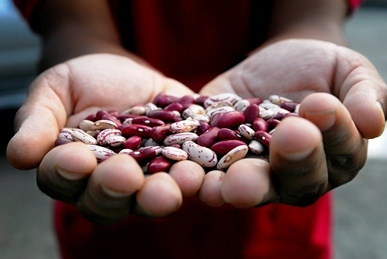 THE NEAR-PERFECT FOOD: Common beans (Phaseolus vulgaris L) comprise the world’s most important food legume, feeding about 200 million people in sub-Saharan Africa alone. Their nutritional value is so high, they have been termed ‘a near-perfect food’. 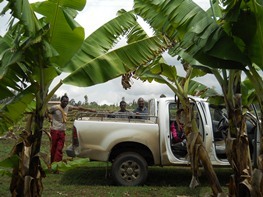 They are also easy to grow, adapting readily to different cropping systems and maturing quickly. That said, this otherwise versatile, adaptable and dapper dicotyledon does have some inherent drawbacks and ailments that crop science seeks to cure…. 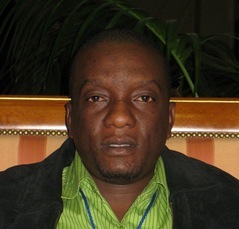 Despite the crop’s widespread cultivation in Africa, “yields are low, stagnating at between 20 and 30 percent of their potential,” remarks Steve Beebe, GCP’s Product Delivery Coordinator for beans, and a researcher at the International Center for Tropical Agriculture (CIAT, by its Spanish acronym). “The main problem is drought, brought about by climate change,” he says. “And it’s spreading – it already affects 70 percent of Africa’s major bean-producing regions.” Drought decimates bean harvests in most of Eastern Africa, but is particularly severe in the mid-altitudes of Ethiopia, Kenya, Tanzania, Malawi and Zimbabwe, as well as in southern Africa as a whole. 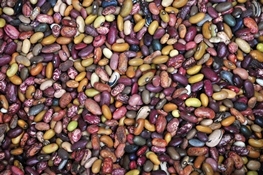 A myriad of forms and hues: bean diversity eloquently speaks for itself in this riot of colours. “Common beans can tolerate drought to some extent, using various mechanisms that differ from variety to variety,” explains Steve. But breeding for drought resistance is complicated by the thousands of bean varieties that are available. They differ considerably according to growth habit, seed colour, shape, size and cooking qualities, and cultivation characteristics. 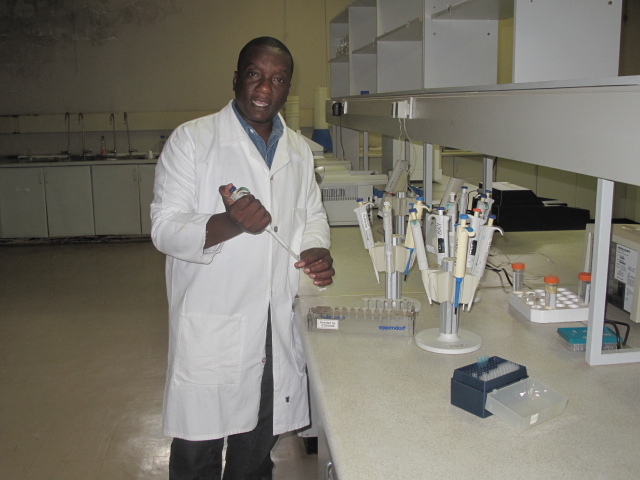 This is where molecular breeding techniques come in handy, deftly dealing with the complexities of breeding drought-resistant beans that also meet farmer and consumer preferences. No guesswork about it: molecular breeding rapidly and precisely gets to the heart of the matter, and helps weave all these different ‘strands’ together. 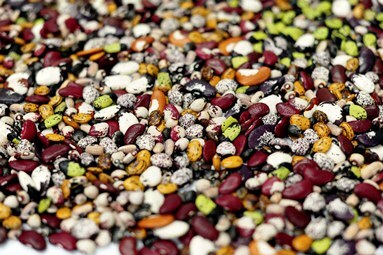 The bean research team has developed ‘genetic stocks’, or strains of beans that are crossed with the varieties favoured by farmers and consumers. The ‘crosses’ are made so that the gene or genes with the desired trait are incorporated into the preferred varieties. The resulting new varieties are then evaluated for their performance in different environments throughout eastern and southern Africa, with particular focus on Ethiopia, Kenya, Malawi and Zimbabwe which are the target countries of the Tropical Legumes I (TLI) project. 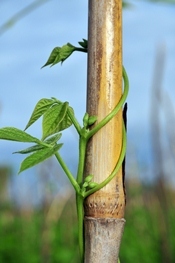 Propping up the plant protein: a veritable tapestry of terraces of climbing beans. GCP supported this foundation work to develop these molecular markers. 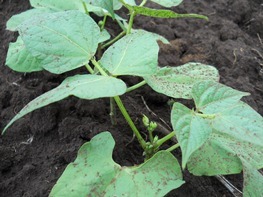 This type of breeding – known in breeder parlance as marker-assisted selection (MAS) – was also successfully used to combine and aggregate resistance to drought; to pests such as bean stem maggot (BSM); and to diseases such as bean common mosaic necrosis potyvirus (BCNMV) and to bruchid or common bacterial blight (CBB). The resulting ‘combinations’ laden with all this good stuff were then bred into commercial-type bean lines. 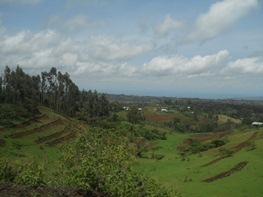 Breeding new useful varieties is greatly aided by first understanding the crop’s genetic diversity, and by always staying connected with the reality on the ground: earlier foundation work facilitated by GCP surfaced the diversity in the bean varieties that farmers grow, and how that diversity could then be broadened with genes to resist drought, pests and disease. Over the remaining two years of Phase II of the Tropical Legumes I (TLI) project, the bean team will use the genetic tools and breeding populations to incorporate drought tolerance into farmer- and market-preferred varieties. 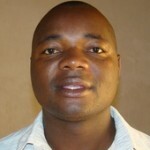 “Hence, productivity levels on smallholder farms are expected to increase significantly,” says Steve. The work on beans is led by CIAT, working in partnership with Ethiopia’s South Agricultural Research Institute (SARI), the Kenya Agricultural Research Institute (KARI), Malawi’s Department of Agricultural Research and Technical Services (DARTS) and Zimbabwe’s Crop Breeding Institute (CBI) of the Department of Research and Specialist Services (DR&SS). 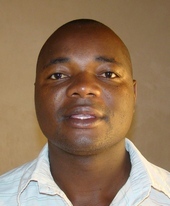 Other close collaborators include the eastern, central and southern Africa regional bean research networks (ECABREN and SABRN, their acronyms) which are components of the Pan-African Bean Research Alliance (PABRA). Cornell University (USA) is also involved.